For 99.9% of people, the biggest purchase they’ll ever make will be their home. In fact, it’s never even close; it’ll dwarf the cost of their next biggest expense, which will probably be their car. No-one would run their vehicle into the ground after they had spent so much money on it! They’d make sure there were no dents, it was clean, and that they can get as much money for the car as possible when they come to sell it. The same approach should be taken with your home, which is more than just a place to lay your head; it’s an investment. As such, you need to take steps to make sure that the value of your investment is going in only one direction. We show you how below. It’s not always the big things that you need to keep an eye on; grouped together, those small things can have a severely detrimental impact on your home. Take the cleanliness, for instance. It’s not always convenient to have a deep clean, especially when you’re tired from work, but it’s worthwhile in the long run. A thorough deep clean every month will help to keep the build-up of dirt and grime at bay. If that’s allowed to take a hold in your home, it’ll be an uphill task to get everything back to a neutral level when you come to sell. There are some people who think that a “perfect” home looks and feels too clinical. They have a point, but if you have the choice between perfection and multiple small issues that undermine the quality of the home, you should take perfection! It’s easy to overlook a crack in the wall, or a broken fence, or chipped paint on the front door. Individually, they don’t seem to be a big deal. But like a scuff on a luxury suit, they do more damage than their size and overall importance suggests. You’ll have to take care of these issues sooner or later; it’s much easier to correct them as and when they materialise. Plus, small issues can become big issues if they’re left unattended for too long. Not every aspect of your home is going to cause you problems. And even if they do, they might not be enough to compromise your home too much. But there are some areas that can be considered “problem areas” purely because their potential to do your home harm is so great. Two of these included your roof and your gutters. Water damage is no joke! If your roof or gutters are in a bad way, or even slightly vulnerable, then all it’ll take is one severe storm, and you might find you’re waking up to a couple of feet of water in your home. Make sure you’re routinely checking that everything’s in full working order, and correct any issues as soon as you see them. We spend so much of our time inside the house, that we barely focus on the exterior of the home. 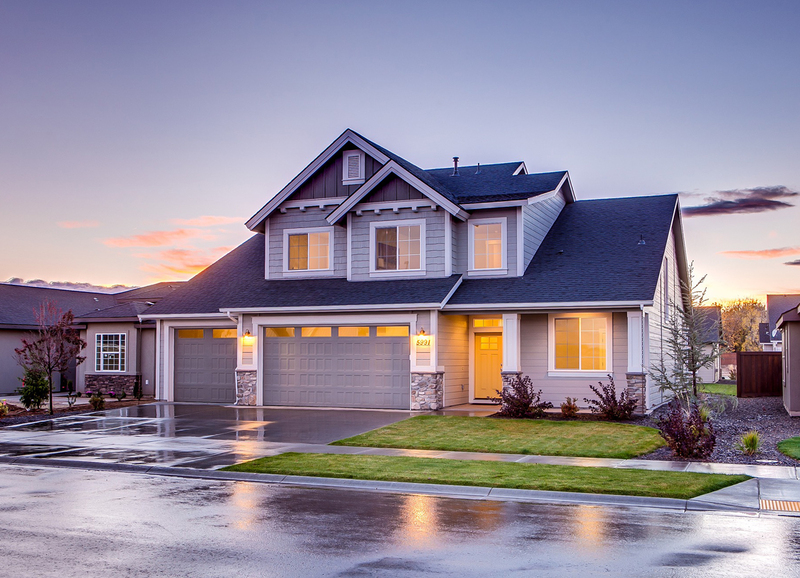 But when it comes to valuing our property, the curb appeal plays a massive role! So while you might walk into your home without even looking up, make a habit of keeping up with the maintenance of the outside. A paint job that’s beginning to fade, cracks in the walls, and overgrown weeds can all reduce the value of your property. And the more these problems are able to develop, the more difficult it is to correct things later on. It seems a bit extreme to say that your house could be under siege by the elements, but it’s true. There are many significant home issues cause by thunderstorms, for instance, but in an indirect way. You’ll want to check the edges of your property to check that there are no overhanging branches around that might, during extreme weather, break off and fall onto your property. They can cause thousands of dollars worth of property, but they’re easy to take care of, so don’t let it happen! As much as you’d like to hope that everything was going to run smoothly, the truth is that you can never be certain of these things! While you can’t control what happens at all times, you can control how well you’re able to handle the bad times when they arrive. The best, most sensible way is to make sure you’re well protected. You can get insurance for your property by taking a look at the policies offered by Leibel Insurance Group. Some of the problems that can arise in the home can be expensive, let’s not forget. If you’re fully covered, you’ll be able to rest easy knowing that if something does go wrong, at least you won’t be left severely out of pocket. There’s a lot to be said for being comfortable with things as they are, but when that spills over into being afraid of change, then you’ll have issues! You should take steps to change the decor every so often. It’ll help to keep your home looking fresh and modern. Plus, paint fades and wallpaper peels after a while! You’ll also want to update your infrastructure, too – things like insulation and other modern conveniences are being increasingly thought of as essential, not luxuries. Don’t get us wrong: there are definitely some things that you should be doing yourself. You can’t be calling out a professional every time you have a minor issue with your house! But similarly, it’s dangerous to try to tackle all the issues yourself. When it comes to things like your electricity and your plumbers, you’ll want to call out people who know what they’re doing. If you make a mistake, it could turn to be pretty darn costly! Unless you’re one of the lucky people who are able to buy their home outright, the reality of the situation is that the investment is only somewhat yours. Until you’ve paid off the mortgage, you run the risk of losing the house to your provider. As such, it’s imperative that you stay on top of payments. There are no guarantees in this life, so even if your job seems secure right now, keep in mind that it could all come crashing down one day. As such, it’s worthwhile putting away around six months salary into savings so that you can handle mortgage payments until you’re able to find a new job. You might have paid a lot for your property, but it’s not always a good idea to close your wallet. There are instances where it’s worth out laying another chunk of cash, in order to boost the value of your home. Take a basement or loft conversion, for instance. The costs can seem initially eye wateringly expensive, but if the return – in terms of added value to your home – is around four times what you paid for it, then it’ll be worth it. Of course, not all “improvements” are worth it, as we’ll see below. If you really want something in your home, then you should go ahead and do it – it’s your home! But before you make grand changes, it’s worth keeping in mind that while the additions might be valuable to you, they might not be to everyone – and could actually decrease the value of your home. Things like a swimming pool, wine cellar, or an overly intricate back yard are all cool to have, but other people won’t pay you any extra for your house because of them. In some cases, they’re more of an inconvenience. There needs to be an element of practicality when it comes to your home. While the fuzzy memories you’ve made in the house might mean you want to hold on to living there for as long as possible, there’ll come a time when doing so seriously affects your long-term financial goals. It’s worthwhile spending some time chatting with a financial advisor about your property. They’ll be able to tell you when you should be thinking about selling. It’ll most likely happen when the children have fled the nest and the house market is performing well. Ultimately, the best thing you can do for your home is to take its upkeep seriously. If you make a habit of looking through the lens of “I paid a lot for this property, I need to keep in good condition” rather than just doing whatever’s most convenient, then you’ll be on the right track towards ensuring you don’t end up losing money when you come to sell. If owning a house was easy, then everyone would do it! Fortunately, there are some tried and tested methods for maintaining the value of your home. Take the tips above, and you’ll be functioning as a responsible homeowner.